UPDATED: Thu., June 22, 2017, 11:57 p.m.
SEATTLE – It’s not always like this, Andrew. Robinson Cano doesn’t hit two home runs every night, but he did Thursday and helped Andrew Moore to a successful big-league debut in a 9-6 victory over the Detroit Tigers at Safeco Field. Moore came as advertised. An efficient strike-thrower. He held the Tigers to three runs and six hits in seven innings before departing to a rousing ovation as he walked to the dugout for the final time. 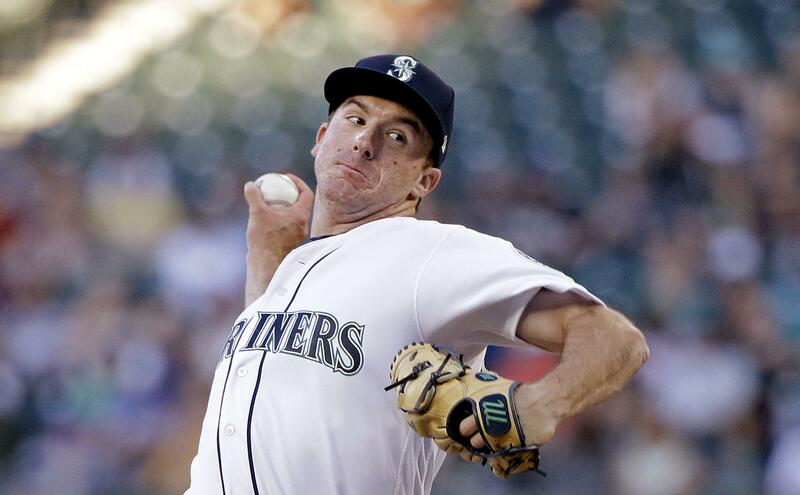 “It was a heck of a debut,” manager Scott Servais said, “but it was kind of what we’ve seen out of Andrew Moore since the day he put a Mariners jersey on. The Mariners led 5-3 when Moore closed out the seventh, thanks in part to Cano’s first homer, a two-run line drive to center in the third inning against Tigers starter Daniel Norris. Francisco Rodriguez replaced Norris (4-5) to start the seventh inning and worked himself into a bases-loaded jam with one out. Cano then crushed a 1-0 fastball for his 11th career grand slam. “I’m not looking at my power numbers,” said Cano, whose last homer was June 6. “But like tonight, sometimes you’ve got men in scoring position, you (want to come through). Cano’s slam made it 9-3, and the game appeared over. The Mariners turned to another rookie making his debut in the eighth inning: 6-foot-8 right-hander Max Povse. The contrast to Moore, who stands 6 feet even, couldn’t have been more striking. Povse got two quick outs before finding trouble. Lots of trouble. Alex Avila doubled, Miguel Cabrera homered and J.D. Martinez doubled and Justin Upton single. With three runs in, the Mariners summoned Tony Zych, who walked Nicholas Castellanos after jumping ahead 0-2 in the count. That got the tying run to the plate, but Andrew Romine struck out. Steve Cishek then drew the ninth because Edwin Diaz was unavailable after pitching the four previous days. Cishek worked a scoreless inning and got his first save since last July 30. The victory enabled the Mariners to complete a four-game sweep and, finally, climb above .500 for the first time this season at 38-37. They have won five in a row and 17 of their last 25. “You’ve got to give credit to all of these guys who came up (from the minors) and were able to do their job,” Cano said. “That’s outstanding. Like the guy (Moore) who pitched tonight. The Mariners broke on top after Norris issued walks in the second inning to Nelson Cruz and Danny Valencia. Ben Gamel extended his hitting streak to 14 games with a two-run double into the right-center gap and scored when Guillermo Heredia flicked an RBI single into right field. The Tigers got one run back on Ian Kinsler’s two-out homer in the third inning – a 90-mph fastball on a 3-1 count. The Mariners answered later in the inning when Mitch Haniger yanked a one-out single to left, and Cano followed with a homer that just cleared the center-field wall for a 5-1 lead. Moore wobbled through a two-run fifth, although the key hit was a bad-hop double past third baseman Kyle Seager. Moore had a chance to limit the damage to one run, but he gave up a two-out RBI single to Kinsler. But Moore retired six in a row over his final two innings. “I loved the way he got on the mound and threw the ball wherever he wanted,” Cano said. “He didn’t try to do too much. He just pitched his game. That’s what you want somebody to do. PLAY OF THE GAME: Shortstop Jean Segura might not be fully recovered from a high right ankle sprain, but he went a long way into left field along the line to catch a pop by Alex Presley in the fifth inning. PLUS: The Mariners matched a season best by winning their fifth straight game…Gamel has hits in 24 of his last 25 games…Cano’s six RBIs were a season high…Danny Valencia shook free from an 0-for-10 slump by going 2 for 2 with two walks. MINUS: Povse had a rough big-league debut: three runs and four hits in two-thirds of an inning…Seager went hitless in four at-bats and is 0 for 7 since his walk-off double in Tuesday’s victory…Mike Zunino went 0 for 3 and is 1 for 10 since hitting two homers Monday in the series opener. STAT PACK: Moore is the 13th pitcher in franchise history to win his debut as a starter. The last was James Paxton on Sept. 7, 2013 at Tampa Bay. QUOTABLE: Moore on his big-league debut: “It still kind of feels surreal. But these guys did a great job of making sure I was calm. Kyle (Seager) made a few mound visits that were big, just making sure I composed myself. SHORT HOPS: The Mariners appear to have no interest in catcher Stephen Vogt (who was designated for assignment by Oakland) or right-hander Doug Fister (recently released by the Angels)…Moore is the 16th different Mariners pitcher to post a victory this season…the Tigers have lost six in a row. ON DECK: The Mariners and Astros open a three-game series at 7:10 p.m. Friday at Safeco Field. Right-hander Felix Hernandez (2-2 with a 4.73 ERA) will return from the disabled list and make his first start since April 25. Houston will start right-hander Joe Musgrove (4-6, 5.09). Published: June 22, 2017, 11:36 p.m. Updated: June 22, 2017, 11:57 p.m.